Climate action is gathering momentum not just because it is a necessity but also because it presents an opportunity – to forge a peaceful and sustainable future on a healthy planet. 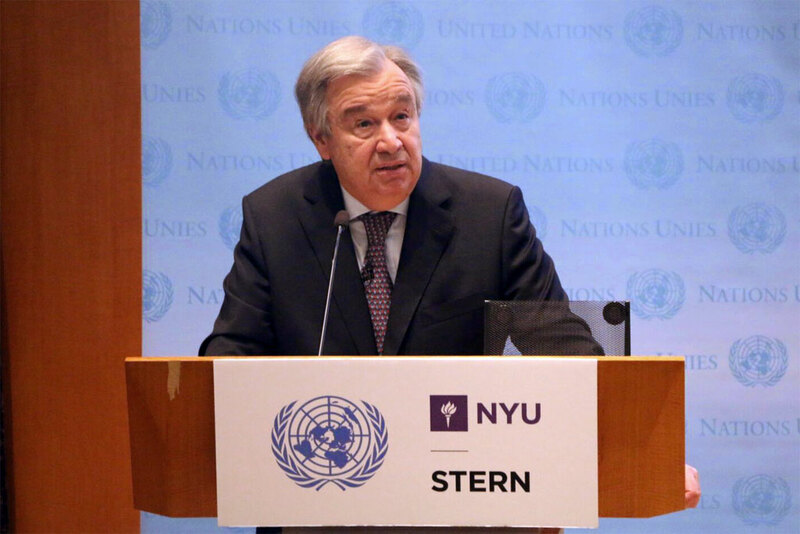 I would like to thank everyone at New York University, and especially the Stern School of Business, for your warm welcome and your role in making today’s gathering possible. Let me also thank all of you for being here to discuss the crucial challenge of climate change and how we must address it. I can think of no better audience – this wonderful mix of scholars and scientists, students and activists, investors and entrepreneurs – the people who, together, are making climate action real. And I can think of no better place to have this conversation than here at NYU and the Stern School, where you are dedicated to cultivating solutions and a new generation of leaders. This notion of inter-generational responsibility is very much on my mind. My grandfather was born in 1875. He could not have imagined the world we live in today. Now I have three grand-daughters of my own – the oldest is eight. I cannot imagine the world they will inhabit decades from now, when they will be my age. But not knowing is no excuse for not acting to ensure that we do not undermine their future. I want my grandchildren to inherit a healthy world, free of conflict and suffering -- and a healthy planet, rooted in low-carbon sustainable solutions. That is my wish for everyone, everywhere. To get there, we have our work cut out for us. Allow me to be blunt. The world is in a mess. Countries and communities everywhere are facing pressures that are being exacerbated by megatrends – like population growth, rapid and many times chaotic urbanization, food insecurity, water scarcity, massive movements of population and migration… the list can go on and on. But one overriding megatrend is far and away at the top of that list – climate change. Climate change is a direct threat in itself and a multiplier of many other threats -- from poverty to displacement to conflict. The effects of climate change are already being felt around the world. They are dangerous and they are accelerating. And so my argument today is that it is absolutely essential that the world implements the Paris Agreement – and that we fulfil that duty with increased ambition. Climate change is undeniable. Climate action is unstoppable. And climate solutions provide opportunities that are unmatchable. Let’s start with the reality of climate change today. The science is beyond doubt. The world’s top scientists have been shouting it from the rooftops. If anything, that disruption is happening even faster than expected. Last year was once again the hottest on record. The past decade has also been the hottest on record. Every geo-physical system on which we depend is being affected, from mountains to oceans, from icecaps to forests, and across all the arable lands that provide our food. Sea ice is at a historic low; sea levels are at a historic high, threatening the existence of low-lying island nations and cities. The seas are also being affected by warmer temperatures, rapid acidification and coral bleaching, endangering the marine food chain on which so many livelihoods and economies depend. On land, glaciers are retreating almost everywhere – a risk to the breadbaskets of the world as rivers fed by glaciers run dry. Soon the famous snows of Kilimanjaro will exist only in stories. Here in the United States, only 26 of Glacier National Park’s glaciers remain. When it was made a Park in 1910, there were around 150. I hope you will never have to rename it “no-Glacier National Park”! Further north, we see an unfolding crisis of epic proportions. The ice caps in the Arctic Ocean are shrinking dramatically. Some even predict that the Arctic Ocean could be ice-free by the summer of 2020. That would be catastrophic for Arctic wildlife. It would be a death-blow to the ways of life of indigenous peoples. And it would be a disaster for the world. Because ice reflects sunlight. Dark water much less. That means warming will accelerate. Frozen tundra will thaw earlier and freeze later, releasing vast amounts of methane into the atmosphere. Methane is a far more potent greenhouse gas than carbon dioxide. This will mean more ice melting from the Greenland ice cap. It could alter the Gulf Stream and affect food production, water security and weather patterns from Canada to India. We are already seeing massive floods, more extreme tornadoes, failed monsoons and fiercer hurricanes and typhoons. But slow-motion disasters are also speeding up. Areas where drought once struck every decade are now seeing cycles of five or even two years between droughts. Moreover, dry spells are lasting longer, from California to the Sahel. The moral imperative for action is clear. The people hit first and worst by climate change are the poor, the vulnerable and the marginalized. Women and girls will suffer as they are always the most disproportionately affected by disasters. The nations that will face the most profound consequences are the least responsible for climate change and the least equipped to deal with it. Droughts and floods around the world mean poverty will worsen, famines will spread and people will die. As regions become unliveable, more and more people will be forced to move from degraded lands to cities and to other nations. We see this already across North Africa and the Middle East. That is why there is also a compelling security case for climate action. Around the world, military strategists view climate change as a threat to global peace and security. We are all aware of the political turmoil and societal tensions that have been generated by the mass movement of refugees. Imagine how many people are poised to become climate-displaced when their lands become unliveable. Last year, more than 24 million people in 118 countries and territories were displaced by natural disasters. That is three times as many as were displaced by conflict. Climate change is also a menace to jobs, to property and to business. With wildfires, floods and other extreme weather events becoming more common, the economic costs are soaring. The insurance industry raised the alarm long ago. They have been joined by many others across the business community. They know that the time has come for transformation. This is why governments adopted the Paris Agreement in 2015, with a pledge to limit global temperature rise to well below 2 degrees Celsius and as close as possible to 1.5 degrees. I applaud the immense efforts of my predecessor, Secretary-General Ban Ki-moon, who brought the essential stakeholders to the table and helped forge this landmark Agreement. It is worth taking a moment to step back and reflect on the unity that was forged in Paris. It was a remarkable moment in the history of humankind. The world came together for the first time to address this global challenge collectively. And it did so at a time of division in so many other areas. There has been nothing like it in terms of enabling the global community to work on an issue together that none of us can solve on our own. Today, it is increasingly understood that implementing the 2030 Agenda for Sustainable Development goes hand-in-hand with limiting global temperature rise and increasing climate resilience. As of today, 147 Parties representing more than 82 per cent of greenhouse gas emissions have ratified the Paris Agreement. Every month, more countries are translating their Paris pledges into national climate action plans. Yes, not everyone will move at the same pace or with equal vigour. But if any government doubts the global will and need for this accord, that is reason for all others to unite even stronger and stay the course. It is reason to build ever broader coalitions – with civil society and business, with cities and states, with academia and community leaders. Indeed, all around the world, cities, regions, states and territories are setting their own ambitious targets. Thousands of private corporations, including major oil and gas companies, are taking their own action. They know that green business is good business. It is not just the right thing to do, it is the smart thing to do. Some may seek to portray the response to climate change as a fundamental threat to the economy. Yet what we are witnessing in these early years of a systemic response is the opposite. We are seeing new industries. New markets. Healthier environments. More jobs. Less dependency on global supply chains of fossil fuels. The real danger is not the threat to one’s economy that comes from acting. It is, instead, the risk to one’s economy by failing to act. The message is simple: The sustainability train has left the station. Get on board or get left behind. Those who fail to bet on the green economy will be living in a grey future. On the other hand, those who embrace green technologies will set the gold standard for economic leadership in the 21st century. Last year, solar power grew 50 per cent, with China and the United States in the lead. Around the world, over half of the new power generation capacity now comes from renewables. In Europe, the figure is more than 90 per cent. The falling cost of renewables is one of the most encouraging stories on the planet today. In the United States and China, new renewable energy jobs now outstrip those created in the oil and gas industries. China aims to increase its renewable energy by about 40 per cent by 2020. Major oil producers are also seeing the future and diversifying their economies. Even Saudi Arabia announced plans to install 700 megawatts of solar and wind power. And industry experts predict India’s solar capacity will double this year to 18 gigawatts. Boosting energy efficiency is also crucial – for reducing climate risk and for increasing profits. The International Energy Agency has indicated that investing in energy efficiency could increase global economic output by $18 trillion dollars -- more than the outputs of the United States, Canada and Mexico combined. Future spending on energy infrastructure alone could total some $37 trillion dollars. Now if that is the case, it is crucial for such massive investments to be sustainable and climate-friendly; otherwise, we will lock ourselves into bad practices for decades to come. Given the facts about youth unemployment, air pollution and climate change, surely it is common sense to put our investments where they will generate the most savings, create the most jobs, deliver the biggest health dividends and have the most impact against global warming. Surely that is why nearly two dozen of the world’s most successful business leaders, entrepreneurs and venture capitalists plan to invest in a fund called Breakthrough Energy Ventures, led by Bill Gates, to reduce greenhouse gas emissions with clean energy technology. It is why green bonds are starting to come in many different shades as the size of the market for securities designed to benefit the environment is on track to double again – from $93 billion dollars in 2016, to $206 [billion dollars] this year. It is why 60 per cent of the world's 500 largest asset owners are taking steps to recognize the financial risks associated with climate change. And it is why more than 7,000 cities in the newly launched Global Covenant of Mayors have agreed to report their emissions and climate progress according to a standard set of tools that are more rigorous than those currently used by many countries. Here I want to salute my Special Envoy for Cities and Climate Change, former New York City Mayor Michael Bloomberg. He is showing great leadership in mobilizing mayors and cities to build the resilient and dynamic cities of the future. Science is speaking to us very clearly about what is happening. Innovation is showing us very clearly what can be done. Today, I call on all leaders of government, business and civil society to back the most ambitious action on climate change for the benefit of this generation and generations to come. [As] Secretary-General, I am committed to mobilize the world to meet this challenge. I will do so in at least five concrete ways. First, I will intensify high-level political engagement to raise the bar on climate action. The Paris pledges are historic but still do not go nearly far enough to limit temperature rise to well below 2 degrees and as close as possible to 1.5 degrees. Commitments so far could still see temperatures rise by 3 degrees or more. So we must do our utmost to increase ambition and action until we can bend the emissions curve and slow down global warming. Most immediately, I will also press for ratification of the Kigali Amendment to the Montreal Protocol on Substances that Deplete the Ozone Layer. Next week’s Ocean Conference at United Nations Headquarters is yet another opportunity to build momentum. Second, I will rally the full capacity of the United Nations development system behind climate action and the 2030 Agenda for Sustainable Development, especially at the country-level. Because that is where true change will be achieved. As we support Member States, I will continue to emphasize the urgency of empowering the world’s women and girls. There can be no successful response to a changing climate without also changing mind-sets about the key role of women in tackling climate change and building the future we want. Third, I will use the convening power of the United Nations to work with Governments and all major actors, such as the coal, oil and gas industries, to accelerate the necessary energy transition. Eighty per cent of the world’s energy still comes from fossil fuels – oil, gas and coal. We cannot phase out fossil fuels overnight. We have to engage the energy industry and governments to use fossil fuels as cleanly, sparingly and responsibly as possible, while transforming our energy systems. I will work with all actors to promote a global energy transition, the greening of investments in infrastructure and transport, and progress on carbon pricing. More and more politicians, policy makers and business actors are calling for a carbon price as the green economy’s missing link. Putting a price on carbon at a global scale could unleash innovation and provide the incentives that industries and consumers need to make sustainable choices. Fourth, I will work with countries to mobilize national and international resources to support mitigation, adaptation, resilience and the implementation of their national climate action plans. And I will focus on strengthening resilience of the small island states against the existential threat that climate change poses to them. I will encourage developed countries to fulfil the pledges they have made to support developing countries – including for the Green Climate Fund. As a matter of global solidarity, the international community must also help developing countries increase their capacity to generate their own resources and to gain access to capital markets. The international financial institutions have a key role to play to help deliver innovative financing that matches the enormous needs. And fifth, I will encourage new and strengthened partnerships for implementing the Paris Agreement through North-South, South-South and triangular cooperation. We need to harness the enormous potential of these partnerships. In all these areas, I will use every possible opportunity to persuade, prod and push for progress. I will count on the vital forces of civil society to do the same. Looking further ahead, I also intend to convene a dedicated climate summit in 2019 to make sure we reach the critical first review of Paris implementation with the strong wind of a green economy at our backs. Let me also stress that my door is open to all who wish to discuss the way forward, even those who might hold divergent perspectives. The climate conversation should cease to be a shouting match. Yet, there will continue to be strong differences about how to achieve our climate goals. Yet it is also clear that the journey from Paris is well under way. The support across all sectors of society is profound. The transition in the real economy is a fact. There will be bumps along the path; that is understandable in a family of over 190 nations. But with everyone’s participation, the world can bring the Paris Agreement fully to life. I look forward to continuing to engage all countries in forging a truly shared vision of the way ahead that leaves no one behind. Let me conclude where I began -- with all of you and with the power of people to make a difference. Climate change is an unprecedented and growing threat. The arguments for action are clear. So are the immense opportunities for peace and prosperity if we act quickly and decisively. All of us – governments, businesses, consumers – will have to make changes. More than that, we will have to “be” the change. This may not be easy at times. But for the sake of today’s and future generations, it is the path we must pursue. This is my message to all the world’s leaders. Students, scientists and others such as you across the world helped to put the climate challenge on the table. If we work together as a global community, we can emerge stronger, safer and more prosperous for our shared future and the future of all of our grandchildren like my three granddaughters.